There is so much to love about this recipe for Mama’s Cream Cheese Pound Cake that I hardly know where to start! First and most importantly, it is coming to you not from my kitchen but from my friend Robyn’s…she is one of my best blogging friends and her beautiful Add A Pinch site has always been one of my inspirations. Second, it’s from her brand new, absolutely beautiful cookbook of delectable, easy Southern recipes, which I can’t stop reading over and over for all kinds of reasons (more on that below!). Third, I have three copies of this gorgeous, gorgeous cookbook to give away! And last but certainly not least…this cake. Oh, this cake…a simple and simply scrumptious pound cake that was one of the first things Robyn learned to cook with her mama. It’s comfort food in cake form. It’s perfect. Let’s make it!But first, I have to brag on wonderful Robyn and her book for a little bit. Robyn was one of the first people to reach out to me when I was starting to get serious about my own blog, and that meant the world to me. Throughout the years I have treasured her generous friendship, her encouraging comments and advice, and of course the role model she has been for me in everything she does with her lovely Add A Pinch website. 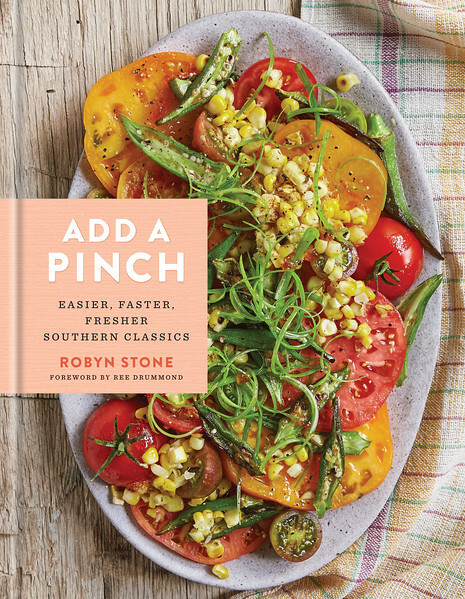 Add A Pinch is a website I visit again and again, not just for Robyn’s delectable Southern recipes (she grew up in the same neck of the woods as the Southern husband!) but also for her beautiful pictures and her sunny, friendly writing. It’s a happy place to be, and I’m beyond excited that she has gathered some of her favorite family recipes and her glorious pictures into this cookbook! Isn’t it delectable? Can’t you just taste that beautiful summertime salad? And while I know I am going to be making everything from Robyn’s creamy artichoke chicken to her sticky molasses bbq ribs, I have to admit right now that the second I got this book in my hands, I turned right to the dessert section. Coconut custard pie. Georgia peach crisp. Buttermilk praline cheesecake!! But I kept coming back to Mama’s Cream Cheese Pound Cake, which was the first cake Robyn’s mama taught her how to make when she was a little girl. Easy, delicious, comforting pound cake, baked in a bundt pan for extra prettiness. It’s friendly and cheery and sweet…just like my friend Robyn. So to celebrate the Add A Pinch cookbook’s debut in the world, I’m giving away three delicious copies! Since this is a collection of easy and beloved family favorites, leave me a comment below telling me about your favorite family recipes, and in a week we will randomly pick three commenters to get this lovely cookbook. In the meantime, you might want to make this happy pound cake for your own family. Yay Robyn!! This giveaway is now closed – but you can still make this luscious pound cake, and definitely add the Add A Pinch Cookbook to your collection! Mama’s Cream Cheese Pound Cake…and a Giveaway! Preheat the oven to 325°F. Spray a 12-cup Bundt or tube pan well with baking spray or grease with softened butter and dust with flour, making sure to coat well to prevent any sticking. In a stand mixer fitted with the paddle attachment (or using a hand mixer), beat the butter, cream cheese, and sugar until fluffy, about 3 minutes. Add the eggs one at a time, beating after each addition until well combined. Add the flour, salt, and vanilla and beat until well blended but do not overmix. Pour into the prepared pan. Bake until the top is golden brown, the cake springs back when lightly pressed, and a wooden toothpick inserted into the center comes out clean, 1½ hours. Let cool for 10 minutes on a wire rack, and then turn the cake out onto the rack to cool completely. This cake is freezer friendly! Let the cake cool completely. Wrap tightly with plastic wrap, then foil. Store in a freezer bag and freeze for up to 3 months. To serve, unwrap and allow to thaw completely before slicing. I love the simplicity of this cake and it brought back so many memories of my mom and grandmother who baked from scratch every week. My absolute favorite was a blueberry cake! Just a few basics ingredients and then piled high with fresh blueberries in the summer! Think blueberry muffin baked in a rectangular pan! It was breakfast hot out of the oven and dessert at night with vanilla ice cream and more fresh blueberries! Oh, the memories of my childhood and the smell of my mom baking! My grandma’s Irish Soda Bread recipe. She’s been gone since 1967 but she is lovingly remembered by at least 3 generations now in this often shared recipe. We actually had to pin her down and get her to give us measured equivalents because she used to just put all the ingredients on the bread board and voila! Oh my goodness – this is so special! You have been such a great friend to me and given me so much encouragement – I will always be so thankful for that! How amazing of you to give away copies of the book and share this recipe! I hope your readers love the cake and the cookbook! Thank you, thank you, thank you! You are the sweetest! What cook doesn’t love a beautiful cake book! And what a sweet friend you are to give away your friend’s new one! Two of my favorite recipes handed down from my mother is Mom’s Apple Cobbler and her own Peanut butter meringue pie. My mom was the very best baker in our very small town in Kentucky, popluation 250. She could make and bake the lightest and most delicate homemade biscuits. She had lots of practice as she got up at 5 AM every morning to have breakfast ready by six for her hubby and six daughters! What a cook she was! Can’t wait to try this recipe for Mama’s cream cheese poundcake, I know it will be delightful! Our family favorite recipe would be my Dad’s Potato Pancakes. I still have the old fashion grinder that we would all take turns turning the handling. Memories really add a good flavor to any dish. One of my nana’s favorite recipes is her picadillo dish. It’s a mexican dish with just some meat and potatotes, but the way she makes… just makes my mouth water thinking about it! My grandma always used to make this dumplings she call “horse dobbers.” There would be a pan of them on the stove and I think they were cooked in ham/bacon grease and really heavy on the salt. Instant heart attack. But she lived till 93, years old, so who knows. I’ve followed Robyn at “Add a Pinch” for a while now on FB. I always enjoy looking at the recipes and trying them as I see them. I think it all started with the Buttermilk Waffles, a few cakes and frostings. I plan to try the Hummingbird cake next. It is by far my favorite baking site. Thank you Kate and Robyn. A big thanks from my wife and 3 kids as well! I better not forget my co-workers who get to enjoy some of this also. My grandmother’s chocolate bread pudding made with biscuits! My grandmother was a great baker. She made loaves of bread shaped like alligators & bunnies which we loved & still talk about – she’s been gone almost 50 years. Her cinnamon rolls were a favorite too. I can’t wait to try this cream cheese pound cake recipe & would love the cookbook. Grammie taught me too cook. A handful of this, a spoonful of that, water hot to the touch, etc. And I would measure and write the recipes so I could cook like her. I always said, “Grammie cooked by heart. ” (She sewed without patterns, too. ) and now, that’s how I cook and bake and see! First of all this pound cake sounds absolutely heavenly Kate! Pound cake happens to be my husband’s favorite, so I think this will be the perfect choice for the Easter dessert table! Secondly, probably our favorite family recipe is a recipe for Hungarian Kifli! I grew up enjoying it (my father was Hungarian) and then started making it for my family. It’s my Aunt’s recipe and it’s a must for every holiday, especially Christmas! My grandmother would come over our house every saturday and teach me to cook. We would bake a different goodie each time, and sometimes we would make supper for everyone, depending on how she was feeling. I had so much fun and learned so much from her. She had this little block notebook that she wrote down her recipes in. I don’t know what hapoened to it, but I sure wish I had it. I remember her making the best whoppie pies ever! They were never dry and the filling was the perfect combination of fluffy and creamy with just the right amount of sweetness. I have tried so many different whoppie pie recipes but have yet to match hers. Such sweet memories I have. So blessed. My mom would make a “doll cake.” A genoise cake baked in a round bowl so when you turned it over, would be shaped bottom of the “dress.” Then she’d put the upper half of a “doll on a spike” into the “skirt”and decorate the cake to match our birthday dress! I did the same thing for her 95th birthday, using cotton balls for her hair. My mom made these doll cakes with angel food cakes for our birthdays in the 50’s. My grandma makes a Ham Pie and that’s always been a family favorite. My husbands side of the family favorite is grandmas hot rolls! My great grandmothers pecan tassies! Make them every year at thanksgiving :) She was the best baker! My mother’s Penne Ala Vodka recipe! It is so simple and so delicious. She was dining at a restaurant and loved it so much that she begged the chef for a copy and he obliged we have been enjoying it on special occasions ever since! Even better, its my husbands favorite meal to prepare :)…. P.S. I can’t wait to try this bundt cake it looks absolutely divine! Wow…It’s not about how any one recipe tasted, it’s about the stories we can tell our children about how we all got together and put a dinner on the table when there was little left in the cupboard the day before payday. For our family, this was all about the humble potato pancake that got an extra egg or two so there was plenty of protein for the growing children. Tamales- We usually make them for special occasions. And. During the holidays! First off love add a pinch! I just made her chocolate cake recipe and chocolate buttercream recipe for my sons 2nd birthday yesterday! He devoured it and so did everyone else it was so good! My favourite thing to make is my great grandmas irish soda bread recipe we just call it brown bread and smother it with jam and cream while we drink tea. So good. My grandma taught me how to make it and I am in charge of making it now for every family get together and holiday. I am definitely going to teach my son and future children this recipe so this delicious tradition can carry on! I would love one of her cook books! Love learning new and delicious recipes to cook for my family ???? I love this recipe! The recipe I have used to be my “go to” recipe a few years ago. Anxious to try this one as well. I love making chicken and dumplings-handed down to me from my mom and grandmother. My daughter asks for my recipe and I tell her measurements were taught as dashes and pinches-hard to convert sometimes. This cookbook would be a welcomed addition to my collection. I love my mom’s Applecake! So moist and full of cinnamon and apples! I love this pound cake recipe! Looks like it is bound to be a hit at our next get together with friends! This recipe reminds me of a lemon cream cheese pound cake my grandmother used to bake in the summer months for our family get togethers. It was always one of the desserts that we looked forward to and enjoyed. Food has always been such an important component in our large family gatherings. It is the one thing that has always brought us together. We each have a dish that is our favorite to make! My favorite family recipe is Bulgogi. Simple but so delectable!!! We have dozens of family recipes but I immediately thought of my grandmother’s pound cake with this recipe. It’s the old fashioned version (1 pound of flour) and we altered it to take out the excessive salt when we make it. 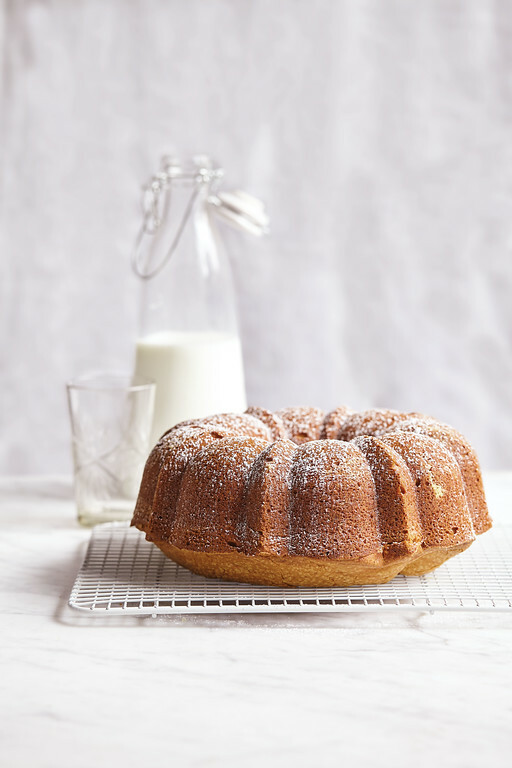 love a great bundt cake and adding cream cheese just makes it all the much better. My favorite family recipe handed down has to be homemade pasta crespelle used to prepare manicotti. Yum! pound cakes are fun you can eat them plain or the toppings are endless. My mother was not a cook but she did make what she called German hamburgers so I make those when I need a mom fix. A family favorite is homemade Manicotti with the crepe part being made on a crepe machine purchased in the 1970’s. I will be making them for Easter dinner. My mother’s pot roast, which she learned to make from her own mother, who died less than three months before I was born. It’s real comfort food, with carrots, potatoes, and onions. I make it for Passover every year. Our favorite family recipe would be my Mom’s Thanksgiving turkey. It was always perfect, moist and the next day’s turkey sandwiches were delectable. Mom has been gone a long time but I can still picture that amazing turkey! I try to duplicate her turkey and come close but it still misses a little something! So wish Mom would have written a cookbook for us all. My mom’s Banana Layer Cake was always our favorite, and it is so sad none of us learned to make it. Lost forever, but certainly not forgotten! Your Mama’s pound cake looks delicious, and who doesn’t love a good Southern cook book! My favorite family recipes are the ones that we would have for Sunday dinner…..roast with gravy, mashed potatoes, baked macaroni and cheese, green peas and grandma’s potato salad. Yum! One of my treasures is the hand written 3×5 card recipe card for peanut blossom cookies. My mom used to make them for the 5 kids in our house. I remember eating far more than my share of them. But what I love most is seeing is my mom’s lovely handwriting on that card. I miss her. one favorite recipe is Gingerbread. it is really more of a cake and we have it every Thanksgiving for dessert. It’s an old Scottish recipe passed down from my grandmother and has no eggs! One of my family favorite recipes is one that was on the back of a Lipton Onion Soup box 25 years ago :) It is Pork Chop Bake and I have to say it is delicious. My kids (even grown) are not onion fans, but this is a dish that they always request when coming home!! great classic pound cake with a tangy twist! My nana’s meat pie, which I make for my family every Christmas Eve. My mother taught me and I taught my daughter. Not all my siblings make it so next I will teach some of my nieces. I think Nana would be happy!! My moms shortbread recipe is the ultimate best! It is a must for holiday baking. My grandmother had a friend Mary who made the best pound cake ever! However, she would never part with her recipe. That was until one day, as an adult, I bumped into Mary very unexpectedly with my husband and young children. I introduced them and explained, “this is the Mary of the “Mary P cake” (which is what we called the pound cake.) She was so proud, the next day she called my mom and gave her the recipe. It’s still a favorite, but still doesn’t taste as good as when “Mary P” made it herself. I bet this cookbook is filled with delicious recipes! One of my favorite recipes is my Grandma’s caramel cake, and her peanut butter fudge a close second. Thanks for the giveaway chance! I love yummy pound cake! My favorite meal is my Mema’s chicken pastry and my Mama’s Devil’s Food Cake! Those two things together is DIVIne!!!!! The cake looks wonderful and I love the concept around her book. Thanks for the opportunity to win a copy! I would love it! What a lovely looking cookbook! I love sitting down and reading cookbooks over and over again. And then I love making all the recipes. This pound cake sounds delicious! My mom’s Cocoa Devil’s Food Cake – from scratch. So moist, so wonderful with vanilla ice cream at our birthday parties. Great memories. My favorite family recipe is Crawfish Etouffee. This book is on my wish list! I have so many favorite family recipes and most of them are on my blog! Over the years, I have become to be known as the pound cake queen! As soon as it starts snowing, I throw one in the oven and whichever neighbors help my husband with the snow shoveling, knows that they will be the lucky recipient! I am so excited to add this cream cheese pound cake to the repertoire! Thank you! Seeing this creme cheese pound cake recipe reminds me of my mother and the Creme Cheese Coffee Cake she used to make. She probably made more of these than any other baked item. I’m sure there were many versions out there but hers was always good, full of cinnamon and nuts. But the most memorable part was that after she spent the whole day looking after us kids, cooking, cleaning etc she would make them late at night when things calmed down and she had time to herself. If there was a special occasion such as holidays, neighbors, company, our teachers, etc, they all got a coffee cake and she always made an extra for us! Pound cake! That looks to be all kinds of yummy! My grandma’s fudge was the best and I make and share many batches during the holidays. This book looks great! Thanks for the chance to have one!